One of the best indicators of just how enthusiasm for fine chocolate has grown in Utah in less than a decade is the response to the chocolate exhibit at the Natural History Museum of Utah in Salt Lake City. 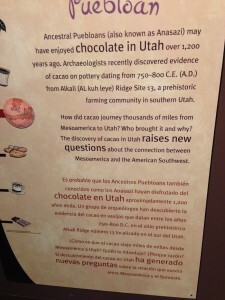 Chocolate’s connection to Utah spans many hundreds of years. It’s not uncommon for the exhibit, which chronicles neatly the long cultural and anthropological history of chocolate up to and including most recent developments, to draw more than 2,500 visitors on weekend days, according to estimates provided by NHMU staff members. And, the most recent two-day chocolate festival at the museum proved to be equally popular, especially in connecting visitors to some of the best-known craft chocolate makers in Utah who are developing international reputations in the industry. 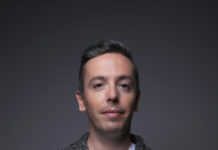 Among those featured was Scott Querry from Solstice Chocolate, one of the newer entries in the market. 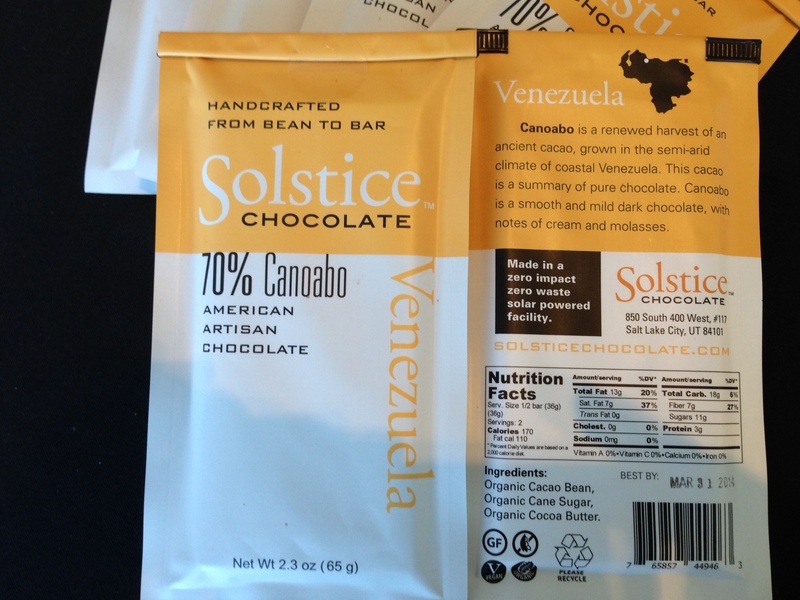 Single origin bars featuring Madagascar Sambirano, Bolivias Palos Blancos, and Canoaba cocoa beans from Venezuela along with a Wasatch bar featuring blends of beans from Costa Rica, Dominican Republic, and Ecuador were featured. As with Art Pollard of the Orem-based Amano chocolate maker and others, Querry is part of a growing movement of makers who have cultivated profiles of production and ethical responsibility that reward consumers as well as farmers and campesinos. Querry also is looking at varieties that are just appearing on the radar for their potential, including beans from Bundibugyo in western Uganda. Unlike the typical forestero bean found in most African farms, the beans in this Ugandan co-op represent a higher grade of trinitario with hints of peach and apricot tones. At Amano, Pollard epitomizes just how much the artisan chocolate world has changed and expanded so much in less than a decade. Visitors to the festival were able to sample some of the most successful and highly prized bars including the Guayas bar, which features the Nacional bean exclusively cultivated in Ecuador. Some of the smoky notes along with hints of tropical fruit such as green banana and blackberry and a beautifully controlled profile of slightly acidic taste make this bar extremely versatile. Amano’s chocolate made its presence known in other products featured at the festival including Amour’s raspberry rose chocolate spread and Butcher’s Bunches products, both Utah enterprises. Versatile entrepreneurship characterizes Utah’s craft chocolate industries and one of the prominent examples is Eric Durtschi’s Crio Bru, a business which started in a Sandy, Utah warehouse barely four years ago and has now grown to a rapidly expanding enterprise with 12 full-time employees in a Linden, Utah plant and with products reaching more than 1,000 retail outlets. Durtschi adds the number is expected to reach 3,000 later this year. Durtschi’s enterprise has helped to focus attention on one of the oldest chocolate preparations, a xocoatl or ka’kao drink that originated among the Mayans and was lost during colonial times. One sample incudes the Crio Bru Maya beverage, which can be readily brewed in a traditional coffeemaker or French press, and which has a smooth, comfortable feel of cinnamon and pepper. For vegans, A. J. Wentworth at the Utah-based The Chocolate Conspiracy continues to improve the raw chocolate bar, which does not involve roasting or the conching process, which many craft chocolate makers use to remove tannins and round out the aromatic profiles before the chocolate is tempered and allows the cocoa butter to crystallize. By avoiding conching, which can be a process of up to three days for some craft chocolate makers, Wentworth is able to maintain a bar that is more textured and a bit more acidic in taste. 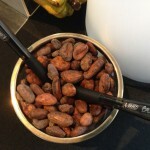 Wentworth is able to control the bitterness level because he uses beans that typically have lower levels of acidity than in other varieties. Honey also is used in the bar production process. 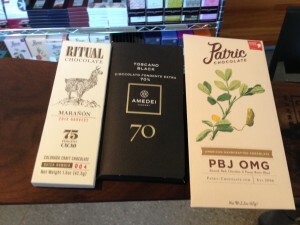 Festival visitors also were able to sample different confections featuring well-known brands of high quality chocolate. 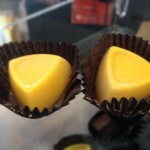 Among the most interesting offerings were by Ruth Kendrick at Chocolot. 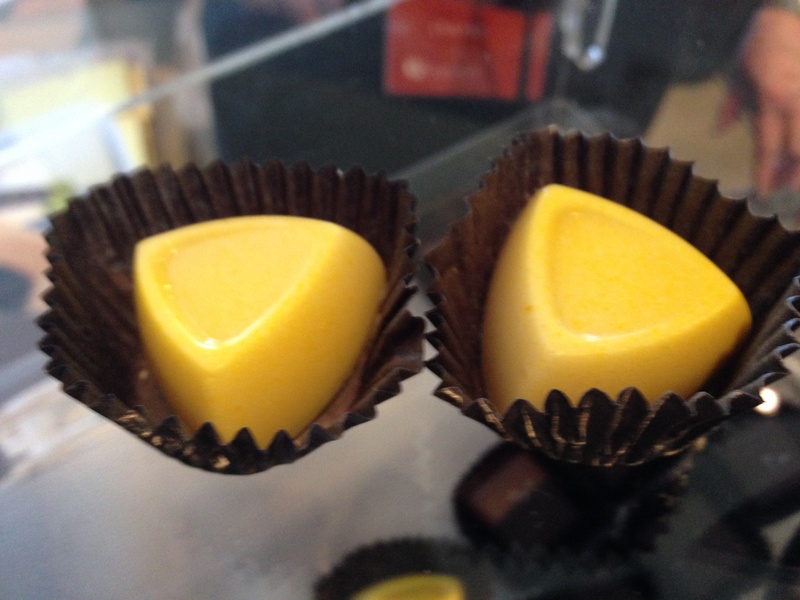 Her Meyer Lemon confection had a naturally citrus silkiness, as it is made with E. Guittard’s 35 percent cocoa butter white chocolate. For Aztec Spice, among one of her best sellers, she uses E. Guittard’s 61 percent chocolate bar. Of course, the festival would not have been complete without the presence of Tony Caputo’s Market and Deli, which boasts one of the nation’s most extensive collections of fine chocolate bars and confections, ranging from Amedei to Ritual Chocolate [both featured at high-profile annual chocolate events at the store] and to hundreds of different preparations from makers throughout the United States and around the world. 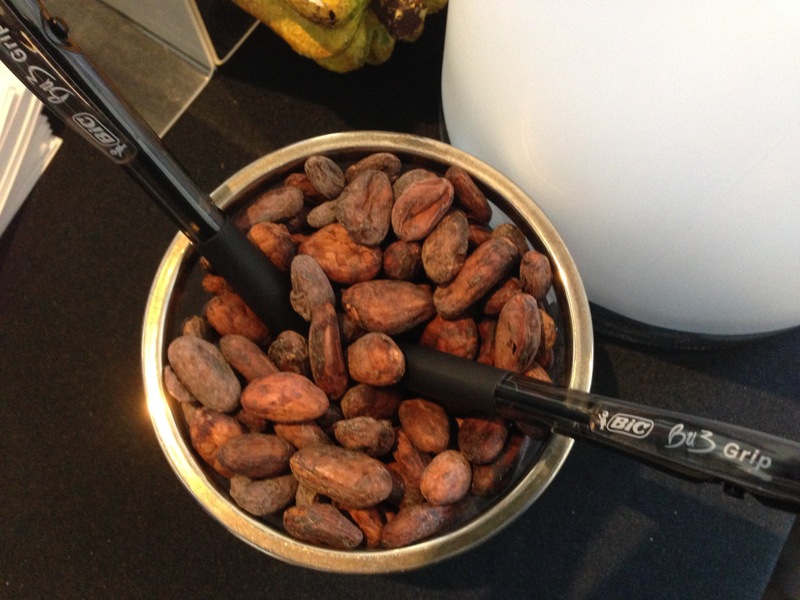 Caputo’s education classes and chocolate events also have done much to demonstrate why and how the process of making chocolate distinguishes one producer from another, even if both have access to top-quality beans. The misconception about chocolate being easy to make is being dispelled by the talents and efforts of chocolate makers and Caputo’s has been effective in sharing knowledge and how many makers operate with the precise minds of scientists in a laboratory. The NHMU exhibit, which continues to June 1, underscores just how much the fine chocolate industry has changed within the last 25 years. Indeed, the history portrayed in the exhibit is not lost, as a new generation of chocolate makers acknowledge that consumers can enjoy an immensely pleasing product with memorable flavors and healthful culinary benefits that rely on specific, known sources of high-quality cacao without the use of preservatives or additives. Likewise, the business model is meant to take the erroneous, imprecise, and impersonal contexts out of terms such as “fair trade,” “rainforest alliance,” “organic,” “certified,” and “single estate.” Like international colleagues such as Italy’s pioneer Amedei, Utah chocolate makers clearly work toward the goal where farmers earn higher prices for their product and other benefits that include knowledge sharing with agronomists and industry support. For more information about the NHMU chocolate exhibit, see http://nhmu.utah.edu/chocolate.